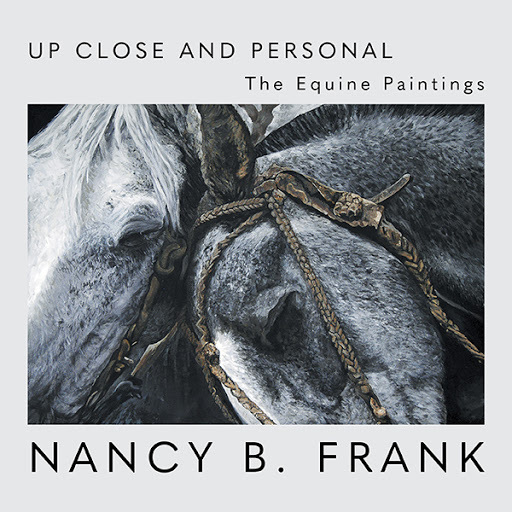 Nancy B. Frank’s sensually brushed horses are powerful creatures, beautifully articulated with great attention to detail. It was as if I were in slow motion, half on, half off, seemingly watching myself from above as I flew through the air. When I finally did hit the ground, I just lay there, assessing, my pride hurt more than anything physical. I looked up and around to see my young horse facing me with an “I won” attitude. He had spooked without warning at an open door. The only problem was that he hadn’t spooked away from the scary opening, he had spooked towards it, meaning his motion had been deliberate and dishonest. That was the first hint my boy just might not be the horse for me. I remember going home that evening, sitting on my couch where I wept and wept. I had recently lost my mother, with whom I had been close—uncommonly close. She was my best friend. Within months of my mother’s death, I lost three cats and then my dog. This horse seemed the final betrayal. By the time he left, I had come to realize that his departure was not a death, but a decision: a huge difference. I had learned that it was time not to dwell in the past but to create new beginnings. Obsessively, I was driven to find his replacement. Video after video I watched robotic horses going ‘round in circles under restraining hands while the price ever increased. Had I not done so much research, I doubt I would have appreciated the big white horse advertised through a rescue group, pictured walking through a drive-in with his rider aboard ordering a burger. This horse resonated. I was attracted to him because of his beautiful movement and his kind eye. Had I flown to Southern California, as I was coached to do, to ride a horse before purchase, I doubt I would have bought him. Instead I took the risk and simply had him shipped to me with the rationalization I had a month’s trial period. He arrived during a full moon. That first night his white coat glowed in the moonlight It was as if there were a huge magical Unicorn in my yard: my mother’s totem. Why was I determined to buy an untrained horse that had had abusive early training? My new horse was a rescue that had never had a “person”. I was a person in mourning who needed rescuing. I could feel my mother’s nod of approval. I named him Silver Lining. Available at Amazon.com, Google Books, iTunes and Freisen Bookstore online. Diablo, Rodeo, Derby, The Thinker, and Silver Lining are among a group of 12 paintings of horses Nancy B. Frank has on display in February at Telluride Arts’ Gallery 81435 in a show entitled “Up Close & Personal.” And because artists tend to depict aspects of themselves in their work – portraits obviously, but landscapes, even abstractions too – Nancy B.’s sensually brushed horses are powerful creatures, beautifully articulated with great attention to detail. Dignity and intelligence shine through their soulful eyes. The multi-talented Nancy B. is a larger-than-life personality whose larger-than-life equine images don’t just rinse the eye with equine grace and majesty. We are treated to a full bath. So move over George Stubbs. A dark horse is closing in on your lead and really feeling her oats. The path she took to her persistent muses may have been winding, but once this gifted artist hit her stride, Nancy B. was – and remains – unstoppable in the genre. When she was a girl, Nancy B. did not just love horses, she thought she was a horse. The artist – who holds an M.F.A. in photo-printmaking at the University of Wisconsin-Madison and a B.F.A. in painting from Ohio Wesleyan University – has lived in Telluride since 1989. Out of the gate, Nancy B. has worked successfully in a variety of mediums: jewelry, sculptured cakes, painted furniture, faux painting and photography. In fact, her whimsical, over-the-top cakes landed her a feature in The New Yorker’s popular “Talk of the Town” column. Back then, however, when she painted, Frank’s subject matter was, frankly, all across the metaphorical map: planets, pearls, birds, and bats galore. While decorative and technically proficient, these early works amounted to lots of hustle, no flow. And despite her childhood passion for equines, fact is Frank had routinely shied away from horses as a suitable subject matter. Nancy B. knew that history and had swallowed the standard rap on horse and “sporting” art in general: holier-than-thou critics, even other painters, have historically looked down on animaliers, those who painted only animals: they were minor artists who produced work for the amusement of the leisure class only. That was true even in the 18th century, the Age of the Horse. Those feelings changed when Nancy B. began doing equestrian travel to different countries and cultures. Because of digital photography, she was able to paint from her original color photographs. Nancy B. found herself painting horses from the strength of her photographer’s eye – and the heart of a person who loves them. Nancy B. never liked empty spaces on canvas, so she photographed her horses to fill the screen and, subsequently, the picture plane, with haunches and heads, manes and tails, glossy coats, bits, and reins in extreme close-up. And in doing what she does in the unique way she does it, Nancy B. reigns supreme: her horse images are fraught with the dynamic tension embodied by these powerful, proud creatures, bound up with tack, yes, but only superficially submissive. Inside – and just like the artist herself – they will always remain unbridled. As the show at Gallery 81435 proves, Nancy B.’s horses mark the moment the artist came into her power, the result of finding her natural subject and creating work that is very very good – and honoring that fact of her life. Nowadays, when it comes to painting horses, Frank owns the finish line. The truth of Nancy B.’s close cropped style will out. “A Show of Horses” concluded a two month display of my work at the Ross Art Museum on the campus of Ohio Wesleyan University, my Alma Mater. The shared exhibit was held in conjunction with the Little Brown Jug harness races, an annual event in Delaware Ohio. The bronze sculptures are by Lynda Sappington while the antique artifacts were from the Harness Racing Museum and Hall of Fame. The show received stellar support from the University and local community, which included two of my x art professors who came to the opening. September 11, 2016, Peter Tonguette of the Columbus Dispatch wrote “Horse Show Exudes Plenty of Personality”. He found the exhibit “well timed” and was keen to observe facial expression and mood in my subjects. He may have overlooked, however, an important dimension in my work; an emphasis of portraying not only the joy and beauty and the incredible spirit of the horse, but his character, his condition and his plight. I am unafraid to express horses burdened in leather, straps and gear imposed by his human master. I have traveled to several countries and equestrian cultures-Portugal, Costa Rica, Uruguay, Patagonia, to name a few, as well as in the States, to experience and photograph both good and not so good relationships between the horse and human. I have been witness to methods and treatments of the domesticated horse not always kind but dominance based-an animal “broken” for human use. In stark contrast to my observations, I train and ride horses of my own, wanting to not only provide amnesty and refuge for these vulnerable teachers, but I seek that higher level of pure unspoken partnership. I pursue at length the most gentle and humane equipment and training techniques, befriending my horses, hoping to gain their trust, love and respect. I paint in near realism and present my subjects as sensitive, soulful creatures. What makes my paintings unique is that, beyond their surface beauty and nobility, I have an understanding of the human entrapments which might bind and confuse these extraordinary animals, yet they are willing to work with us.